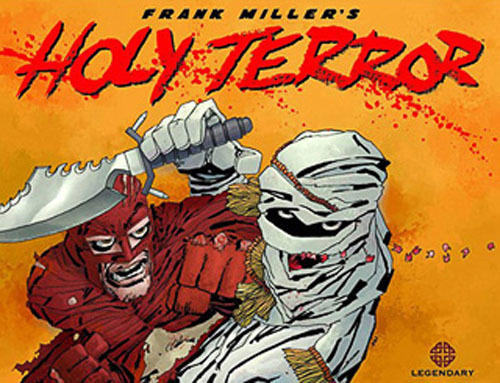 I got a chance to read a preview copy of Holy Terror, due in comic shops tomorrow. Here's the short version of my review: Batman and Catwoman versus Al-Qaeda, by Frank Miller. Longer version: Strictly speaking, it's not Batman and Catwoman, of course. But even if Miller hadn't made it pretty public that this used to be a Batman story when he first conceived it, it very much feels like an extension of Miller's Dark Knight books. The characters are analogically obvious. If he hadn't used coloring techniques more akin those he used in Sin City, there'd be almost not distinguishing this book from the others. The story is basically that The Fixer and cat burglar Natalie Stack get caught in a couple of pipe bomb explosions, which leads them on a hunt for the terrorists who set them off. They've got some big biological weapon they're going to kill everyone in Empire City with, and those first few bombs, as well as the missiles that take out the Blind Justice statue in the harbor, are just warm-ups. Fight, fight, fight. Torture, torture. Fight, fight, fight some more. Turn the big bomb back on the bad guys. End. The book is gorgeous. Every page is a work of art, and they're all well-designed, well-laid-out and well-executed. Lots of excellent use of light and shadow. The story-telling, too, is really smooth. Miller does a very good job working through the story and making sure it flows well for the reader. The issue is, though, there's not much story there. The story really is simply: what if Batman and Catwoman fought a cell of Al-Qaeda. There's no explanation, much less examination, of the terrorists' thinking. Terror for terror's sake. Batman's rogue's gallery in the 1960s had more rationale than these guys. Even The Fixer's motivations aren't given; when Stack asks about origins alluding to Batman and Superman, he just says that he's been training for this for a while. Stack is even less plausible since she's a villain herself; she gives a "not on my turf" one-liner and that's it. The only story element that I thought really worked was that, as the night progresses and more things blow up, we see the "talking heads providing their reactions" bit. A lot of politicians and television celebrities are shown, but none of them are given any dialogue. Which I take to mean that they would all say exactly what you'd expect them to say and none of it of any real substance. And, oddly, that's what Holy Terror comes across as on the whole. It's exactly what you'd expect Miller to create if he were to do a Batman vs. Al-Qaeda story. Plenty of the things that fans like to see Miller do, and him doing them well, but none of it of any real substance.